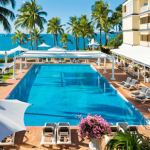 Paul Darrouzet, owner of the multi award-winning Airlie Beach marina precinct, Abell Point Marina, last week exchanged unconditional sale and purchase contracts for the acquisition of the iconic Coral Sea Resort. This strategic move is the next step in Darrouzet’s plan to continue developing Abell Point as a leading international marina. Abell Point Marina over recent years has experienced a $30 million upgrade and now hosts 520 wet berths, berthing to accommodate vessels up to 80m in length and award-winning restaurants and venues. With impeccably maintained grounds and a beautiful new 2.5 hectare garden opening in the new year, the marina already boasts a resort-like feel. 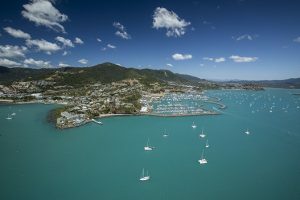 The addition of first-class boutique accommodation and an enticing array of facilities – including an award-winning oceanfront restaurant, a private dining seaside gazebo, cocktail lounge, fitness room, private jetty, 25 metre pool, wedding chapel, 200 seat function room, resort shop and tour desk – will contribute to the marina precinct becoming a premier mainland destination resort. Greg Waites will continue as General Manager of the Coral Sea Resort, working closely with Abell Point Marina General Manager, Kate Purdie, who will oversee the integration of the resort into the marina precinct. The Abell Point Marina team look forward to working together with the team from Coral Sea Resort to ensure a smooth and successful integration over the coming months.